Blondin Park is an 8.5 hectare public park in Northfields in the London Borough of Ealing. It has allotments area and sports pitches. It is owned by Ealing Council and managed by the Council together with the Friends of Blondin Park. 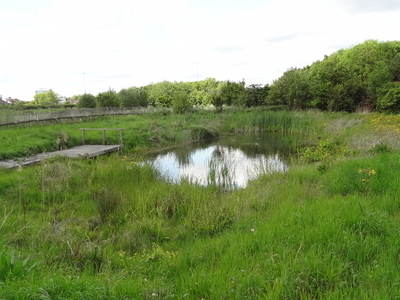 An area of 2.3 hectares in the south-west corner is a Local Nature Reserve, and the nature area and allotments are a Site of Local Importance for Nature Conservation. The nature reserve has a variety of habitats, including a wildflower meadow and a pond, where wetland plants have been introduced such as lesser pond-sedge, sharp-flowered rush and greater spearwort. There is access from Boston Manor Road. Here's the our members favorite photos of "Nature Reserves in London". Upload your photo of Blondin Park!